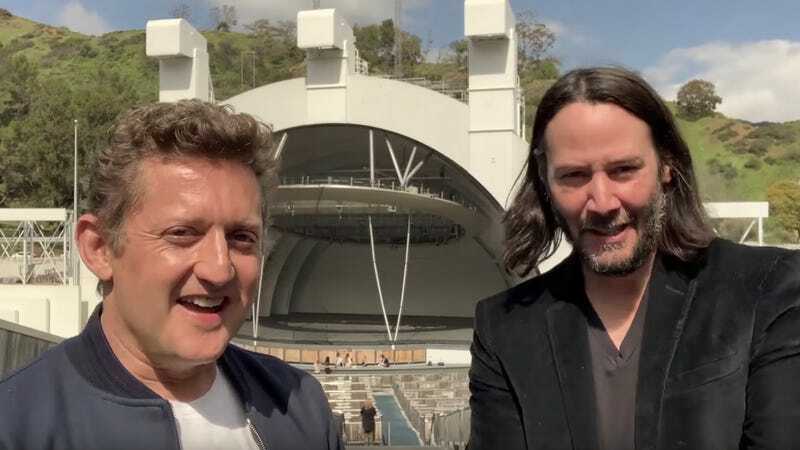 Alex Winter and Keanu Reeves posted a very special video today. Jump in your phone booth and set a course for August 21, 2020, because that’s when Bill and Ted are going to Face the Music. Excellent! Directed by Dean Parisot (Galaxy Quest) from a script by franchise creators Chris Matheson and Ed Soloman, here’s how the film is described in a press release. Following 1989's “Bill & Ted’s Excellent Adventure” and 1991's “Bill & Ted’s Bogus Journey,” the stakes are higher than ever for William “Bill” S. Preston Esq. (Winter) and Theodore “Ted” Logan (Reeves). Yet to fulfill their rock and roll destiny, the now middle-aged best friends set out on a new adventure, when a visitor from the future warns them that only their song can save life as we know it and bring harmony to the universe. Along the way, they will be helped by their families, old friends and a few music legends. Filming will take place in New Orleans—and Solomon, for one, is beyond excited that this project is finally happening. We can’t wait to see what Bill and Ted have in store, and to find out what they’ve been up to all these years. And personally, as an L.A. resident, here’s hoping they actually will play at the Hollywood Bowl in this film. All the Latest News on Iron Man 3, Bill & Ted 3, and Walking Dead! Inside scoop on Bill and Ted 3, Doctor Who and Green Lantern. Plus a crazy Superman rumor!